$9.4 Million iPhone 4S Seems Reasonable | OhGizmo! By David Ponce on 12/06/11 • Leave a comment! Because there’s apparently no shortage of people with more money than good sense, there appears to be a market for items such as this. The brainchild of Stuart Hughes, the iPhone 4S Elite Gold is the world’s most expensive phone. The most unique mobile phone ever created with a total construction cost of £6 million. The bezel is handmade from rose with approx 500 individual flawless diamonds which total over 100ct. The rear section is formed using 24ct gold with the added touch of its 24ct gold Apple logo and 53 diamonds. The main navigation is made from gold which holds a single cut 8.6ct diamond. Also included (not shown in picture) is a rare 7.4ct single cut Flawless pink diamond which can replace the existing one. 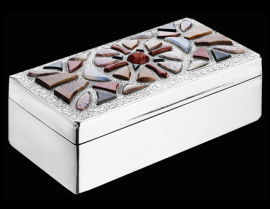 The chest is made from solid Platinum with polished pieces of original Dinosaur bone from the T-REX along with rare stones such as Opal, Pietersite, Charoite, Rutile Quartz, Star Sunstone. The handset is 64gb and limited edition of only 2 to be ever made.